In Ladakh – India’s arid land bordered by rugged Himalayan peaks – lies a beacon of hope for the poor, sick, elderly and underprivileged children. Ladakh, India -- Fifteen years ago, six-year-old Dechen Dolma and her father left their village and took a long, arduous journey by road over high passes to arrive days later in Choglamsar, a village near Leh, the capital of Ladakh. Dechen was horrified when her dad left her at the hostel there. “I cried and didn’t want my father to leave,” recalls Dechen, now 21. Then, a kind-looking monk told her gently, “Please don’t cry, we will take care of you." Today, Dechen is a pretty and articulate young lady who has just completed her Bachelor of Commerce degree and is one of the many graduates of the Mahabodhi International Meditation Centre (MIMC) in Ladakh, India. Sprawled over 93ha, the non-profit and non-sectarian MIMC comprises a residential school, hostels, a charity hospital, old folks home, nunnery and a home for the mentally challenged and blind. A brainchild of Theravadin monk the Venerable Bhikku Sanghasena, MIMC began life as a meditation centre in 1986. In 1992, Sanghasena started a free school for 25 children from poor remote villages like Dechen’s. Dechen came from Chushul Village in the Chang Thang Valley. Chang Thang’s arid landscape allows little cultivation and the nomad population is constantly on the move, herding flock of sheep and Pashmina goats in search of pasture. Dechen’s family couldn’t afford to send their eldest child to school. MIMC takes in these underprivileged kids, educates them and provides free room and board and medical care. Today, the school has almost 500 students (with a few paying students) and provides education to kids from pre-school to 10th Standard (which is equivalent to Form 5 here). The hostels house 95 boys and 96 girls each. MIMC also has branches in Timisgam and Bodhkarbu villages, a four to eight hour drive from the Devachan campus. Currently, 32 MIMC students are pursuing their undergraduate studies in Bangalore and Chandigarh. The centre is open to everyone, regardless of race or creed. “You’re a human being, just like me. We’re born and we die in similar ways, sharing the same planet, under one sun and moon,” says the dynamic and amicable founder. Aside from the school and hostel rules and regulations, students are allowed the freedom to choose if they want to learn the Buddha Dhamma (teachings of the Buddha) or not. “We encourage students to follow and be faithful to their own religion,” adds Sanghasena. Almost half of Ladakh’s population are Shia Muslims and the other half are Buddhists. MIMC is an IARF (International Association for Religious Freedom) member and organises interfaith dialogues annually in Ladakh. Dechen and her friends who grew up in MIMC are not obligated to return to help out at the centre, Sanghasena explains. “We fulfil a role that is sometimes more than a parent’s. They’re like our own children,” says Sanghasena. “It just gives us immense pleasure to see these children educated.” But some students like Dechen and her friend Tashi Lhamo, 22, plan to return to MIMC. Tashi, also from Chang Thang, has also completed her degree and will be starting work at MIMC. “Here, we also learned to be good human beings, share our love and compassion with others,” chips in Tashi, who has eight siblings. Mahabodhi’s 50-bed Karuna Charitable Hospital also gives free medical care to poor Ladakhis. A general physician, surgeon, ophthalmologist, dentist and an anaesthetist, four part-time medical graduates and nurses help run the hospital. The clinic also has a full-time amchi (traditional Tibetan medicine) doctor. MIMC runs mobile health clinics and women’s literacy projects at remote villages. Under the Devachan Green Project, the residents are greening the once arid desert land with fruit trees like apricot and apple, vegetable garden patches and willow and poplar trees. In the past 20 years, MIMC has been depending solely on generous donors from overseas and India. Most of the students rely on kind sponsors from abroad. It costs US$450 a year to sponsor a child’s education, room and board, clothing, books and stationery. 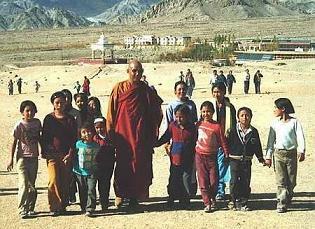 The private school accepts students from Leh or other parts of Ladakh, who pay monthly tuition fees. But the hostels are filled to the brim. “Sometimes we get parents who come with sad, pitiful stories and we just can’t turn them away,” says Sanghasena. MIMC earns the little extras from its guestrooms, which charge 350 Indian rupees (US$ 8) per day for room and board, Internet caf? and its Vipassana meditation courses and retreat centre. They also plant vegetables to reduce shopping costs. Solar energy, donated by a foreign foundation, is used to generate electricity and heating during the severe winter. Ladakh’s scarce rainfall causes a major water problem in the desert land especially when the mountain springs dry up. Over the years, it has counted on donations and volunteers for its water project to drill ground water and lay out underground pipes. “We’re also looking at organisations that can support us on a long-term basis for our various expansion projects,” says Sanghasena. It has been a long, bumpy but worthwhile journey for MIMC. “My dream is for a beautiful centre for people from different countries and religions to come and stay, exchange ideas, develop a sense of global responsibility and contribute to world peace,” sums up Sanghasena.